The incredible quantity and profound fatness of squirrels here in the Fort has been an ongoing source of amazement to me. Everywhere one turns five or six squirrels frolic in trees, gambol along sidwalks and bike paths, and wreck general havoc on bird feeders and planters. 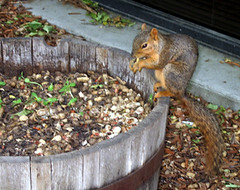 Without apparent predators and with an excess of food, the squirrels are relatively tame, gluttonous and face few daily challenges. Occasionally I find myself wondering whether they are truly happy in this unchanging squirrel eden or whether they, like us, require some challenge and strife to maintain equanimity. This morning it is possible I got my answer. One could question the same for the felines. Hmmm.. or zoofolk.. sole worries of day-to-day living are eliminated. What about the effects evolution has/will have? Cats have been domesticated for many hundreds (thousands) of years.. how has it affected their overall kittyness. Lazy catnappers. Doesn't everybody need a yahma buddy?